What, No Baby? takes us on a journey into the lives of contemporary women who plan to have it all - marriage, motherhood and work - yet have been derailed by reluctant men, insatiably demanding jobs and the everclimbing expectations of what it takes to be a ‘good’ mother. 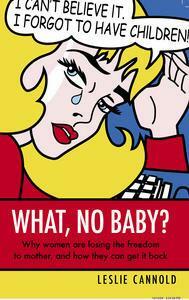 Columnist and author Susan Maushart said Cannold offers ‘fertility crisis management par excellence’ and columnist Julia Baird said it was ‘easily the best book I have read about the dilemma facing young women’.